Raw, friendly and easily altered, plaster is a very versatile medium. Beautiful in its luminosity, yet open to receiving a multitude of alterations, it will easily agree to being painted, carved, cast and sculpted. 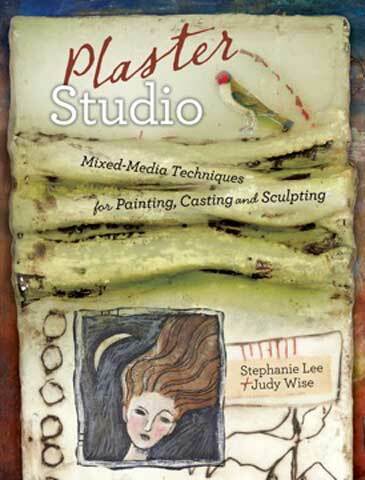 This book includes 24 stepped-out projects introducing artists to a variety of plaster forms & techniques intended to inspire them to develop their own creations. Inside Plaster Studio they will discover that plaster is the perfect surface for receiving image transfers; that encaustic medium makes plaster projects glow; that book pages and covers can be made from plaster; that plaster can give depth with the use of stencils; that cast objects from plaster are easy to create and add to other works of art and that wire armature can bring three-dimensional intrigue to an endless amount of possible projects when combined with plaster. Gallery pieces from the authors and contributing artists provide readers with inspiring plaster examples. Readers can mix up their first batch of plaster and see what Plaster Studio will inspire their imagination to carve out.